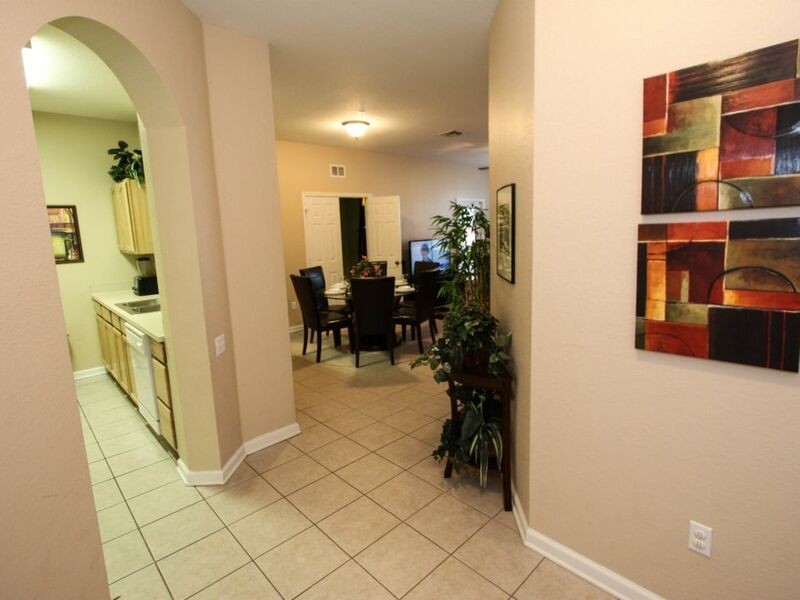 The condo was very spacious and clean and really close to Disney. We had a great view of the Disney fireworks from the condo balcony which was really cool and fun for the kids! My five year old loved the bunk beds at the condo. Condo was well stocked. even had a couple pack n plays, strollers, high chair, etc. They really thought of everything to make it convenient for families! We would definitely try to stay here again the next time we plan a Disney trip! Kathy B. Just wanted to say a big thank you & how much we enjoyed staying in your condo. It had everything required to make our stay comfortable. We loved how close it was to Disney, Convenient to get to Walmart. If we decide to come back to Orlando next year, I will definitely get in touch. Rochelle N.
Barry’s condo is awesome , well stocked , quiet location and clean . Plenty of space for a condo . Centrally located . We had 8 people , and for comfortable! No complaints at all :) even had a stroller that we brought to Disney Anne P.
This condo was exactly as pictured and in a great location. We weren't able to see the full fireworks due to a large tree, but the walk to the clubhouse, pool and basketball courts were super convenient. Most importantly, it was clean!I would definitely recommend this specific condo. Easy check in. Quick response on service call about internet (and quick over the phone fix). Booking was simple. Quiet 4th floor location. Master bed was creaky and sunk in the middle and bath towels need an upgrade. Other than that, this is a great place. God space and nice to Comfortable and has good supply of kitchen pots, pans, plates, bowls and flatware. Would recommend and would stay again. Thank you for your review Amy, we have shared with our team and will share your comments about the mattress with the owner. We change towels and linens on an as need basis. Thank you and we look forward to your next stay with us. Was a very nice and clean place to stay. Very close to Disney. Pool was great. Always a quick response with the few questions we had during our stay. It would be nice to have some kitchen amenities, such as seasoning, oil, ect. We thought about leaving what we had bought, because we had used very little of it. But they ask that the kitchen be cleaned out of such items or there is a charge. Which I understand why they do it, but at the same time. Every condo we have stayed at in the past had such items when we arrived. Barry’s condo is awesome , well stocked , quiet location and clean . Plenty of space for a condo . Centrally located . We had 8 people , and for comfortable! No complaints at all :) even had a stroller that we brought to Disney . Thank you for your review Anne, we have shared with our team and look forward to your next stay with us. Thank you. We enjoyed the condo and the facilities at Windsor Hills. The property is beautifully maintained. We had some ceiling light bulbs replaced. When the maintenance person inquired if we had other issues, we just mentioned the microwave turntable wasn't working. They looked at it and the next week a new microwave was installed. Thank you for the prompt response. We will be back! Thank you for your review Tom, we have shared with our team and look forward to your next stay with us. Thank you. Thank you for your review Elizabeth, we have shared with our team and look forward to your next stay with us. Thank you. Major Credit Cards Accepted. Monthly rates show the rental amount of a four week trip. A 20% deposit is required upon confirmation of all reservations. A $44 limited damage waiver will be applied to all bookings in lieu of a security deposit. Local, State & Federal Taxes 13.5%. Processing Fee $40 per trip.